i wish i could make people care. there are some friendships where i found myself instigating all of the time. one friendship in particular: we’d get dinner or food, and then i’d suggest something else – an activity, or dessert, or something. and they’d say no. i’d understand if you were tired one day or if you had a midterm to study for once in a while. but do you not care about spending time with me? i can’t see myself keeping up this friendship post college, especially since there’s a good chance we won’t be geographically close to each other. same goes for finding the new board for the club i’m president of. my term ends in a month, and we were looking for a new president and vp amongst the current board members who aren’t graduating. no one was willing to become president, and they were all waiting for someone else to do it. do you not care about how this club fares? (i’m also in general annoyed about the lack of initiative). 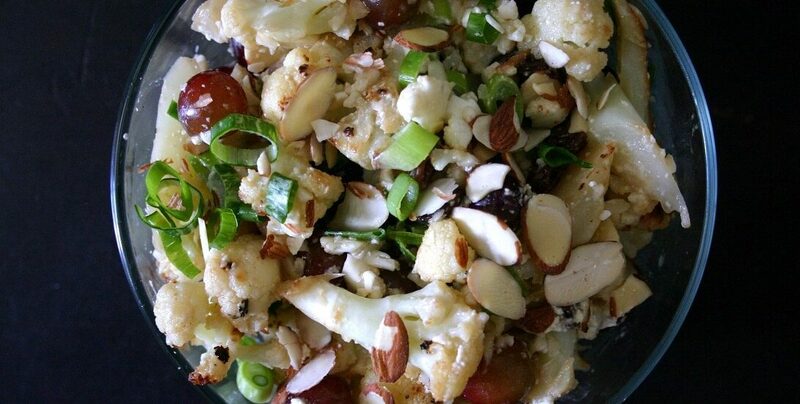 anyways, how about some cauliflower salad with pickled grapes, cheddar and almonds? my family was a little bit weary of this one (i grew up eating vegetables sauteed with a bit of garlic and salt and that’s about it), but i convinced them to care. or you know, the tender cauliflower, juicy sweet grapes, salty sharp cheese, creamy olive oil and yogurt, and crunchy raw cauliflower and almonds convinced them. same thing. 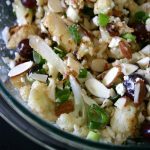 This cauliflower salad with pickled grapes, cheddar and almonds is a delicious warm side dish that hits all the sweet, tangy, nutty, cheesy notes you're craving. In a medium saucepan, combine the raisins, vinegar, bay leaf and salt. Simmer for 5-10 minutes, or until the brine has reduced slightly. Place half of the grapes in a heatproof bowl. Add the hot brine and raisins. Cool completely to room temperature. Cut 1 1/2 heads of cauliflower into small-ish florets. Toss the florets, oil and plenty of salt. Spread on two parchment-lined baking sheets. Roast at 425F for about 25 minutes, stirring once or twice, until the cauliflower is crispy-skinned and browned. Alternatively, you can pan-sear the cauliflower (this works well if you're running short on time). Add 2 T lemon juice to the cauliflower on the baking sheets and half of the cheese, distributing among both pans. Bake for 5 to 7 more minutes, until cheese has melted. Remove cauliflower from the oven and immediately stir it with the cheese so that the florets are coated and almost no cheese streaks remain on the parchment (don't allow the cheese to congeal!). Mix 2 T lemon juice with 1 T vinegar. Whisk in mustard. While whisking constantly, slowly pour in the oil. When your mixture is creamy and emulsified, whisk in the crème fraîche. Season with salt. To a large serving bowl, add the remaining grapes and cheese. Shave the remaining cauliflower on a mandoline into the bowl. Add the roasted cauliflower. Strain the pickled raisins and grapes (you can reserve the liquid to make salad dressing in the future!) and add them to the bowl. Add the almonds and mix it all together. Dress the salad with the vinaigrette, going slowly as to not overdress. Serve warm. Adapted slightly from Sarah Jampel via Food52. That sounds annoying!! I hate when no one wants to step up and do work. Ughh. 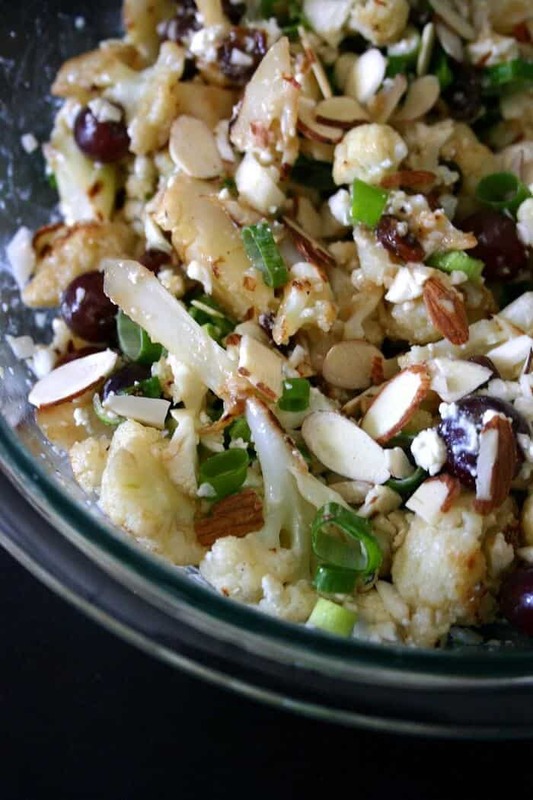 But this cauliflower salad looks yummy! 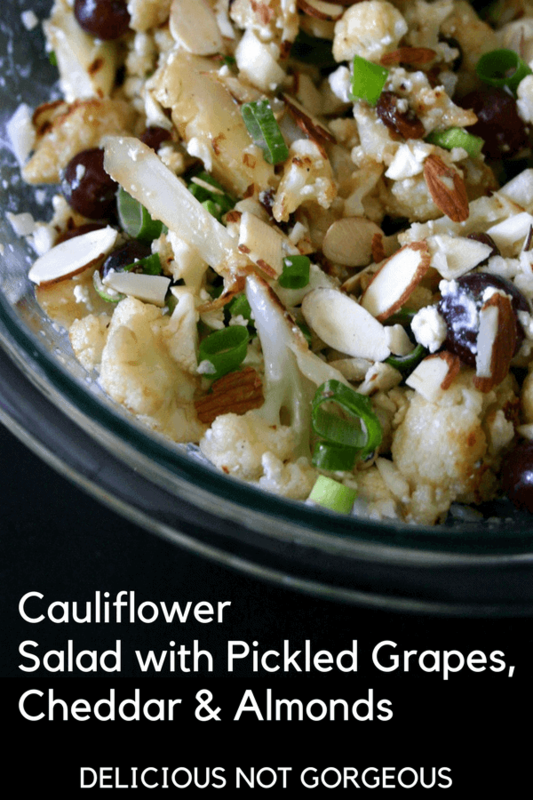 I am such a lover of cauliflower and the flavors in this sound amazing!! Aw, I hate when you invest so much time and energy into a person/thing and they don’t want to reciprocate. But know that your time is precious and there are more deserving people who will want to reciprocate and give you their time!! daw thanks 💕 it’s easier (sometimes!) when it’s a friend and you can choose, but it’s harder when you have to work with that person. sigh. Pickled grapes have got me very curious, I need to give these a try! they’re great! (but also i’m just a pickle fiend haha). I’m with you about lazy friends and club members – wish I knew what it takes to get people to participate in life sometimes. (GRRR). But, this salad sounds so so good – and like nothing I’ve ever had. So much YUM! yeah, being a motivator and a cajoler is a skill i don’t quite have yet. sigh. i need salads that are interesting- if it’s just lettuce and dressing, i’m eating a bite and then switching to something more complex (and probably unhealthier haha). I have an old friend who I hear from once in a while. She always says I we need to get together, but there is always some life complications that make it hard for her to do so. As much as I like to maintain that friendship, it is just not worth chasing. This salad looks delicious and full of texture and flavor. I never thought of pickling grapes, but it sounds wonderful in this dish! yeah, this is one of those friendships. i’m not that close to them anymore, so it’s not as hard/painful to step away from it, but it’s still kind of a disappointment. I find it frustrating to have people in my life like that! yeah. we used to have some good times together, but i don’t think it’s worth trying to cling onto those memories and trying to recreate similar experiences. 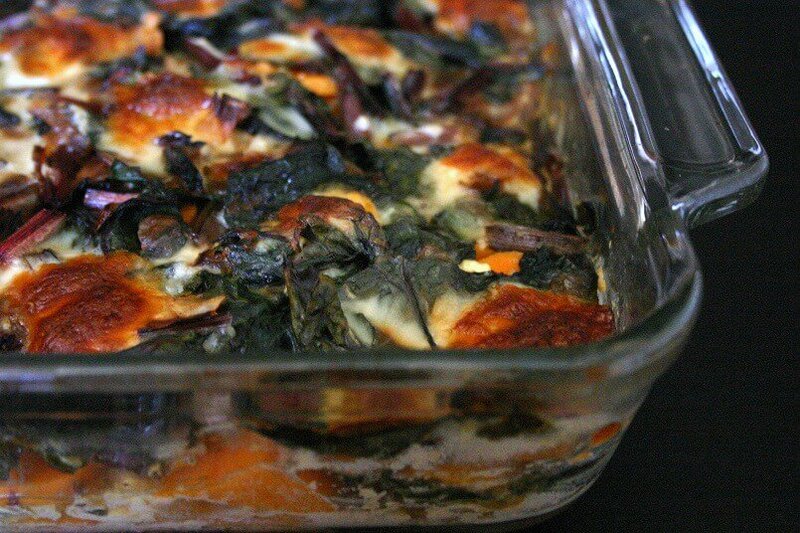 Fabulous…these dish looks soooo good & delicious with most beautiful color, this is one of my favorite recipe as well. I will try to making this in upcoming few days. Thanks for sharing……! You always put together the most interesting flavor combinations. And I mean interesting in a good way! I love everything in this salad! Yum!! Okay, now I am 100% curious as to what PICKLED GRAPES taste like! PS: If you are always initiating hanging out with your friend, she/he mayyyyy not be worth your time! try them!!! if you like pickles, and you like grapes, you’ll probably like them (; (or maybe not). Loving all those intriguing flavors! Pinning! 🙂 Happy Weekend! Ahhh I think I’m on the other side of that friendship right now tbh Heather! It’s good to know what the other side thinks 🙂 Perhaps back off a little for a bit of time? Distance makes the heart grow fonder 😉 Also any plans for after uni? On the lighter side of things, this salad looks fab and I wanna eat it alll right now! yeah, i’m hanging out with other people + going on solo adventures! (: it’s all good. not totally sure! 99% sure i’m moving back home bc most of the opportunities that interest me are there instead of near school, plus can’t beat that free rent (; going travelling for a few weeks after graduation though, so super excited about that! Love roasted cauliflower, and the pickled grapes and raisins sound fantastic! Such a great idea for a salad! Love all the different flavours and textures in this salad, especially the roasted cauliflower and grapes. What an unique combination of ingredients; it looks delicious! Yeah, it’s always a letdown when your actions aren’t reciprocated. This recipe sounds crazy town delicious! I’ve never pickled grapes before so I’m all kinds of curious about what they taste like! Thanks for sharing tis lovely recipe. It sounds really super yummt :). It’s not cool when you’re doing things that other people want but when you wanted to pick something out, they’re not down. Like what is the issue?? You definitely deserve friends who would make an effort and meet you almost halfway. Sending you good vibes with finding competent new board members! The same thing happened to me my 3rd year and someone ended up nominating themselves for the lulz. I like the sound of your cauliflower salad recipe! Thanks for sharing it :)! ooof. 2 positions filled, 8 to go. very interested to see how it turns out, and hoping for the best. I’m a huge fan of Cauliflower! It’s seriously my JAM. I’m also a fan of pickled grapes, sweet, sour and tangy. I’m always super busy but I value the time I spend with my friends. If your friend always makes excuses they may not really be your friend, just a thought. Raw Cauliflower is super crunchy and satisfying, this looks like one tasty salad. Thank you for sharing Heather. i never tried cauliflower in salad form.. sounds delicious. 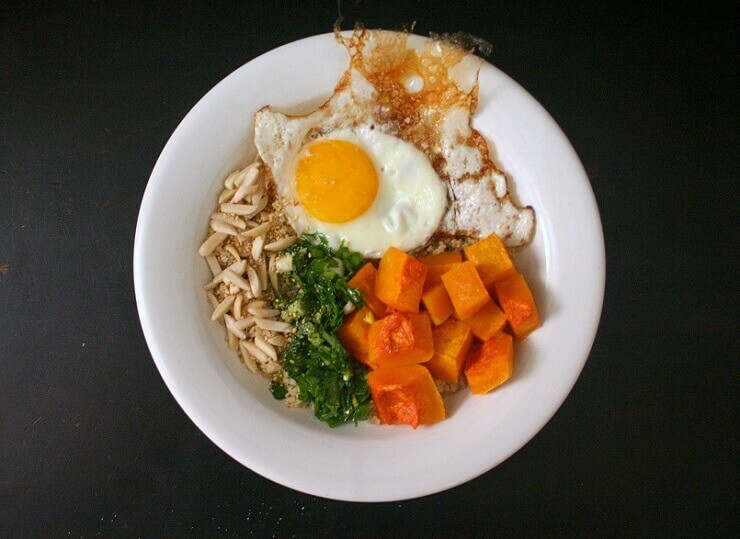 This recipe looks mouthwateringly delicious! It’s starting to get warmer where I am and I’ve been craving those yummy spring salads! This one definitely fits the bill. I love the idea of the pickled grapes! I had a pickled grape and nut cheese appetizer on my previous food blog. They’re so delicious and simple to make and I bet they go GREAT with roasted cauliflower. I’ll be trying this soon! Thanks for sharing! and what?! southern california is in a major cold snap this week, so i’m all about the soups right now haha. and oooh, i love fruit + cheese so i bet that’s a great appetizer! Sadly there’s always friends in college that don’t last beyond graduation, and if it wasn’t for Facebook you’d never think of them again! On a plus side this salad sounds just perfect to me. I always add grapes to my salad for a little sweetness. yeah :/ (although tbh i already know i’m going to do a facebook friend purge post-college and i won’t even think of them again lol). i add fruit to all my salads (; i found some 88 cent blackberries the other day and they’ve been in my lunches all week!